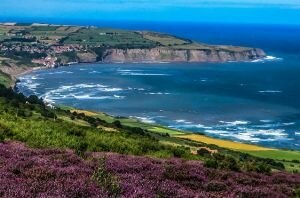 Researchers at the University of York have used sea water taken from Whitby in North Yorkshire, and scrap metal to create a technology that could help capture over 850 million tons of undesirable carbon dioxide (CO2) in the atmosphere. High levels of CO2 in the atmosphere are a chief contributor to global warming and greenhouse gases. Carbon overload is primarily the result of combusting fossil fuels, such as oil and coal, as well as deforestation. Worldwide efforts are being made to decrease CO2 levels as well as develop novel methods of capturing surplus gases from the atmosphere. The York team has currently discovered a way to safely capture the gas as dawsonite, a solid mineral and natural component of the Earth’s crust. We wanted to look for methods of trapping the gas using environmentally friendly tools to produce a result that could be highly scalable to capture millions of tonnes of unwanted carbon dioxide. We started with the realisation that using graphite, the material used in pencils, to line aluminium reactors, results in the mineralisation of carbon dioxide. We wanted to trap the gas at much higher levels, using low-energy processes, so we decided to look at waste materials, such as scrap metals, to see if this could be done without using chemical agents as a catalyst. Professor Michael North, University of York, Department of Chemistry. The researchers filled the aluminum reactor with sea water procured from Whitby Bay, and waste aluminum such as that found in food wrappings or kitchen foil. The gas is transported to the sea water inside the reactor. Electricity, captured from solar panels, is conveyed through it, resulting in the aluminum turning the dissolved CO2 into the mineral, dawsonite. Tens of millions of tonnes of waste aluminium are not recycled each year, so why not put this to better use to improve our environment? The aluminium in this process can also be replaced by iron, another product that goes to waste in the millions of tonnes. Using two of the most abundant metals in the Earth’s crust means this process is highly sustainable. Professor Michael North, the University’s Department of Chemistry. The research revealed that 850 million tons of CO2 could be mineralized annually using a combination of sea water, solar-powered electricity, and scrap metal, eliminating the necessity to use deadly chemicals and high energy gas-pressurization to create the same effect. In contrast to other electrical reaction systems for CO2 treatment, hydrogen is not required to cause the chemical reaction in the first instance, which would make the process more expensive. Instead, hydrogen is created from the electrical circuit and becomes a by-product of the process. Hydrogen gas, a non-polluting gas is beneficial to the future of fuel manufacture at low cost and ‘zero emissions’. Researchers are currently working to maximize the energy efficiency of the process and allow the hydrogen by-product to be amassed and utilized, before aiming to build toward full-scale production.